It's my understanding, reading about Fender all these years, that Leo ALWAYS made those choices based on price/profit & availability. Of course, is something proves to simply "not work" (like a microphonic tube), then they would HAVE to change it. It depends Charlie. 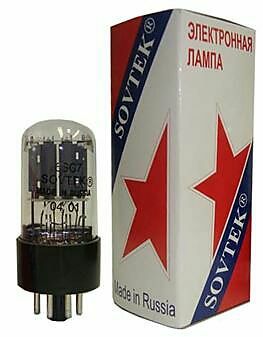 I have found the Russian 6SL7s to go very microphonic, to the point of unuseability, within weeks. Buying NOS or second hand is a crap shoot. If one of mine is slightly microphonic, or goes slightly microphonic, it's shifted over to phase inverter duties in the V2 slot. Recently I bought a couple of Bell & Howell projector amps and they came with the UK equivalent - Mullard ECC35s. I have to say they are hands down the best sounding and least microphonic 6SL7s I have ever come across. Something that helps is the rubber rings you can slip over the valves to reduce ringing from the glass enclosure. I got mine from Tube Town in Germany, but I'm guessing they'd be easy to find in the US too. Here, tube dampers masquerade as non-slip (silicone) hair ties from the druggist ;) They worked a treat on that noisey tube. Yup...original P12R smooth cone. And, yeah...not a treble monster! It's fine...it has its own character. Plugged into the MIC channel and cranked all the way up, it has a sound like I've never heard. It's the best about-to-explode tone I've ever heard. Maybe it was about to explode As with the 5E3, it has interactive controls and there are lovely cleans on the INSTRUMENT channels with the MIC channel dimed (dozened?). There is also that sweet spot from turning up the MIC channel to somewhere around 7-9 when plugged into the INST channel. I did find out that even the best 6SC7 in V1 is crazy noisy at volumes that even begin to distort...a tube damper (silicone hair tie from CVS) mostly fixed it. I've got some NOS RCA, GE and Philco. All about the same rattle. The dampers work well. I've had octal amps, but all little ankle-biters. I like my little Gretsch/Rex/Magnatone, but it's my workbench amp. It's nice to have an octal amp that's giggable...or, at least, rehearse-able. All of the Fender Tweed amps went to 12. The numbers are just usually worn off by now. My mate recently installed a Fane A60 speaker in his 5A3. He's now gigging with it using a Fryette Power Station between the amp output and the speaker. That gives him up to 50W of 5A3 tone at gigs and it's back to 12W or so for home and studio use. So if you want to gig it, there a ways to do so. The Bad Cat Unleash might be another option.